Louisiana is unique as a state among the United States of America. The French have influenced this area since the days of Napoleon. 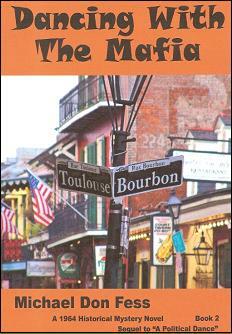 Cajun French was the dominant language in South Louisiana during the period of this novel. The legacy of Huey P. Long still shapes many of today's legislative decisions. New Orleans and Orleans Parish remain as special districts in the state. Many of Huey's successors have served prison terms and as of this writing, the ex-governor, Edwin Edwards, remains in a cell. Many states have graft and corruption problems, but Louisiana seems to excel in this specialty. This novel tries to expose some of the methods used to accomplish those deeds. The characters are fiction, but were inspired by real people in Louisiana history. The series of events depicted here have roots in various family lore, hear-say, and pure fiction, all leading up to an unforgettable climax at the Political Bar-B-Que. The year 1964 - EXERPT from the book . . .
A long black limousine pulled into the parking garage adjoining the Brentley Hotel. A lanky figure in a white linen suit walked through the hotel doorway and started across the concrete floor. Congressman Gladden Flowers strolled toward the limo and climbed through the open door. "I'm happy you could join me, Congressman." "Always glad to see you Carlos," he said as he settled into the luxurious seat. "I want to review our arrangement," he said, his balding head with slicked back hair gleaming under the dome light. "My friends insisted that I make sure that we have a clear understanding." The limo slowly exited the garage and turned to cross the Red River into Pineville. As they crossed the bridge, the air conditioner made the summer heat bearable. "I believe I know how much legal casinos would benefit the City of New Orleans," he said with a smile. "I memorized the estimates of tax revenue increases you provided." "We also want you to be able to overcome most of the moral objections . . . here are some statistics about reduction of crime when gaming is legalized," he said, handing him a sheaf of papers. Gladden Flowers nodded, taking the papers in silence. He knew there had to be a more important reason for this meeting. After a pause, Carlos continued. "I need to bring up something we haven't discussed . . . we will also need you to appoint some of our friends to key positions in the justice system and we want to name some of the promotions within the State Police." Glad's jaw tightened, but he nodded. "In return," he continued, "you will have almost unlimited funds for your campaign and the numbered Swiss account will be waiting for you when your term is over. The million dollars in that account will amount to $250,000 per year during your term in office. Not a bad income when added on to the Governor's salary." The eyes of Carlos Marcello watched his reaction with unblinking interest. "Measure that against the average household income in Louisiana last year of $6,000." he continued. "1963 was a good year and this year, the economy should be about the same." Those eyes continued staring as he paused. The Congressman interrupted the silence by clearing his throat. "As usual, Carlos, you are very persuasive. You can count on my cooperation."